Confused about financial terms in the news? Eager to have reliable background information on the stock market, hedge funds, investment banks, commercial banks or the Federal Reserve? Visit the library and consult Gale's 2008 Everyday Finance. It is on display, together with several other up-to-date reference books on money matters. The library subscribes to the print editions of the Value Line Investment Report, the Value Line Small and Mid-Cap Report and The Morningstar Report. As a subscriber to The Morningstar Report, the library provides in-house access to Morningstar Mutual Funds Online at each of the seven internet stations in the Adult Department. Users should consult the folder on the desktop labeled Morningstar Online to obtain username and password. Morningstar Mutual Funds Online is a PDF report service and all reports may be saved to a disk. Each month, updated full page reports appear on the website two weeks before the print issue arrives. Special reports are issued each quarter. Topics covered recently include Model Portfolios for Retirees and the Best Funds for Income. 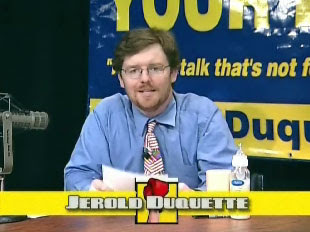 The LCTV talkshow "Put Up Your Duqs" will have an in depth interview with a representative of the Committee for Small Government, which is pushing for the repeal of the state income tax in Massachusetts. The one hour interview IS NOW ONLNE at www.JeroldDuquette.organd will air on LCTV Channel 12 starting Monday, October 13th at 6pm. Leonard Cooperman, representing the Committee on Small Government, provided a thoughtful, if debatable, rational for the ballot measure. An interview with opponents of the income tax repeal measure will be appearing on the show in the next couple of weeks. More information will be distributed on that interview as soon as it is "in the can," so to speak.